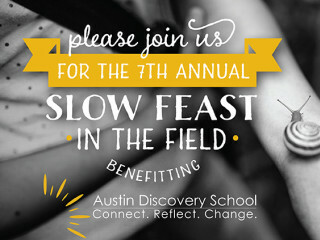 The Austin Discovery School is hosting the 7th Annual Slow Feast in the Field fundraiser, an evening of fresh local food and wine served on the small, historic Green Gate Farms. Local chef Sonya Cote will be preparing heritage hog along with seasonal farm produce paired with local wines as well as signature cocktails from mixologists at the Gibson. All funds support the Austin Discovery School, a free charter school in East Austin that has one of the most innovative gardening and food awareness programs in the state.